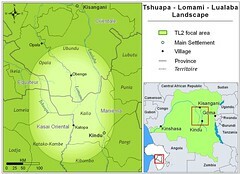 Today, I arrived in Kisangani where Ashley has been for nearly a week, preparing the next trip up the Lomami. Tomorrow the two of us leave on trail-worthy motorbikes for the Réserve de Faune à Okapi in the Ituri Forest. John is already there, getting a field training under way. We all return to Kisangani in a week. From Kisangani, this time we will launch a massive dugout up the Lomami River. So for the next few weeks we will only rarely be able to get on line. In the meantime, we are collecting pictures and trying to understand more about what is happening and how we can make things happen. In a week I hope to post an update — and will catch-up on any thoughts you have had in the meantime. This entry was written by Terese Hart, posted on 2008-02-05 at 8:43 pm, filed under About the project. Bookmark the permalink. Follow any comments here with the RSS feed for this post. Post a comment or leave a trackback: Trackback URL. Good luck in your trip and looking out for your reports, thank you for your continued efforts! Good luck…hope all goes well and cannot wait to hear about your progress. Guys, some folks dream, others follow their dreams. I wish I was in the latter category. Good luck! Terese, John, and Ash, got some very horrific news from the Lola Bonobo blog today about the bushmeat trade. Dear God in heaven, what can we do! They showed photos of dead, smoked bonobos laid out on tables for people to buy, disgusting. The fact is, bushmeat costs a lot more then a chicken or goat to buy, this isn’t about poverty or lack of food. It is ignorance and pure evil that drives this. Being poor and ignorant does not make one virtuous by default! Well, I have calmed down, but my heart is breaking into many pieces…I eagerly await news from your expedition, hope no major mishaps along the way. Terese, Paula, from the Bizara Blog has started an initiative on addressing both the bushmeat crisis and wildlife poisoning…we have to get a grip on this problem. I read that farmers use to plant coffee, rubber plants, cocoa, and palm oil; then take their crops to the Lomani River, where it was placed on barges, and taken to market. All this before the chaos started. When the fighting broke out, the farmers had no safe access to the river, and stopped growing their crops and turning to the forests and bushmeat trade instead. Are you guys seeing any return of normalcy, are the farmers starting to plant again? and what makes me so pride. so many african people say: this is not the right way. lets make it better. in gabon chinese companies are on the way to destroy one of the most beautiful waterfalls. lets say no. lets make it better.